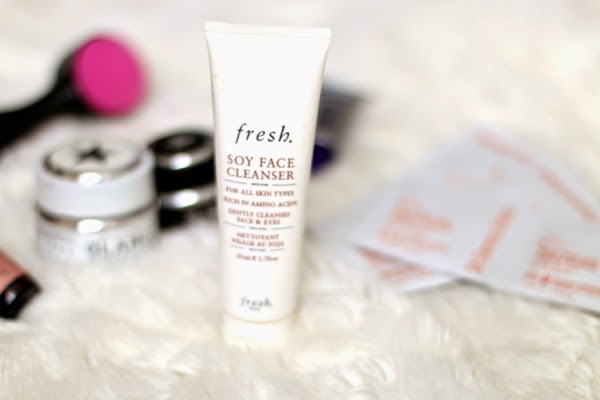 I wanted to share some of my top favorite face products I have been using lately. I find myself always changing up my face routine, by changing it up I mean every couple months. I enjoy trying new things and I think it’s good for my skin. My skin is not my strong suit. I have always struggled with zits & discoloration. I have really good weeks & really bad weeks. So I have become pretty picky about what I use. To completely honest I have found that using high end products have been the best thing for my skin. When it comes to skin care I’m not about taking chances. I want the best of the best. Without further adieu here are my WINNERS! I have explained each one a little and linked them up on the bottom. Comment if you have any questions about anything or product I will get back to you! I wash my face with the Fresh Soy Cleanser. This is a natural cleanser that removes all my make up. I love this cleanser because it feels so pure on my skin and there are no ingredients that would irritate your skin. It comes in 2 sizes which is nice especially if you want to “try” it. For the longest time I got the smaller size because it was easy for me to travel with. I eventually splurged for the larger size & the smaller and now I keep one at home & one in my travel bag. 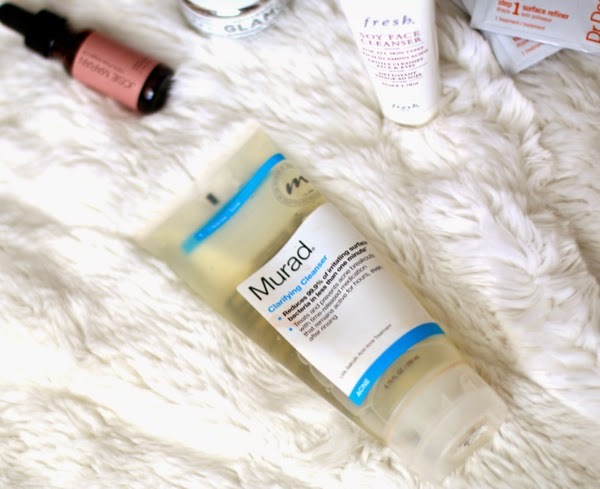 After I have washed my makeup off with a regular cleanser I will then use this Murad Acne Clarifying Cleanser. I use this after all my make up is off because I want it to be able to penetrate my skin as much as possible. This special cleanser has a “tingly icy” sensation. I love it! I feel like it actually is getting in there. I picture the Scrubbing Bubbles commercials, you know, the ones with the little scrubbers scrubbing the toilet. Yeah, that but only not a toilet, just my face haha. SIDE NOTE: when I first stared to use the cleanser I broke out for about 3 weeks! I was so frustrated but then thought “maybe it’s just cleaning my skin out and getting everything out” IT WAS! I now only use it a couple times a week and haven’t one break out! Clarasonic WHAT? Ok, so I have been an avocate for the Clarasonic ever since it came out years ago. It gives you such a deep clean and exfoliation. But it cost anywhere from $100-$250, that’s a lot. It’s even MORE when I found THIS sucker The Dynamic Duo Face Brush it’s from the Sephora collections and it’s good as gold! I actually like it even better than the Clarasonic! I don’t have to charge it, I don’t have to clean out under the heads, and it’s a FRACTION of the price! 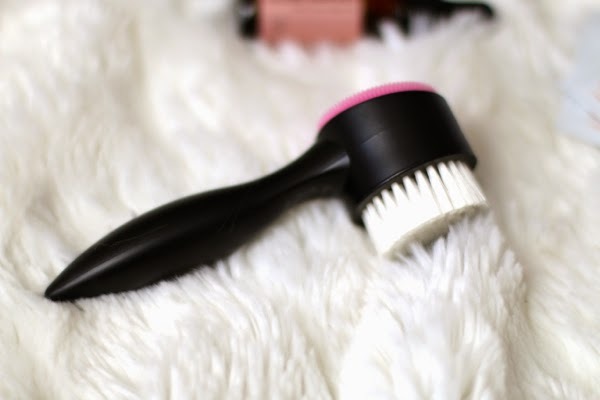 My favorite thing about it is that the bristles on it are a little more stiff so I actually feel I get any even deeper clean and I have control over it! It’s also great to travel with and great for gifts! Dr. Dennis Gross has become my new best friend! These Alpha Beta Peel Wipes are HEAVEN sent! Like I said earlier I tend to have discolored skin tone and little scaring here & there! These have changed my complexion for the better! They peel your skin just enough that you wake up to a new face! GLOW! Just try their sample pack of 5 wipes and you will be hooked! Hooked, I tell ya! The morning after I use them I wake up excited to look in the mirror! It’s smooth, it’s even, and it’s glowing. Miracle! NOTE: I either use these of the mask down below I will tell you about in a second but never both! They are both skin exfoliants and you should never use them at the same time. You will burn your skin! 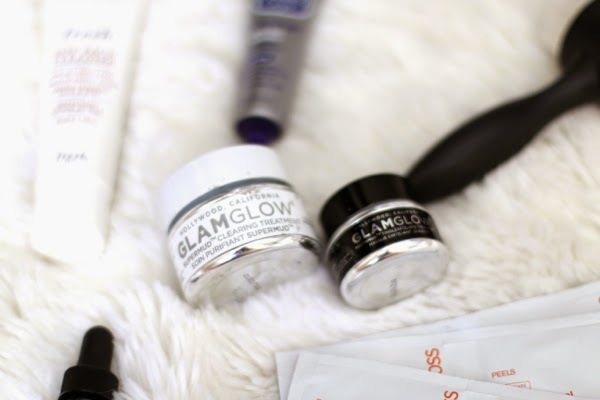 GlamGlow owns a special place in my heart. It have helped me through rough facial times. It is a great detoxing mask for your face. The Supermud Mask is one that may make you break out a small bit the day after but it is truly getting so deep in your skin and cleaning all the dirt out. The Youthful Tinglexfoliant gives you more of a glow after you use it! It gives you a radiant complexion and softer skin! I could never choose one over the other! I use them both at different times. Moisturizer Moisturizer Moisturizer! This is the winner of all winners! 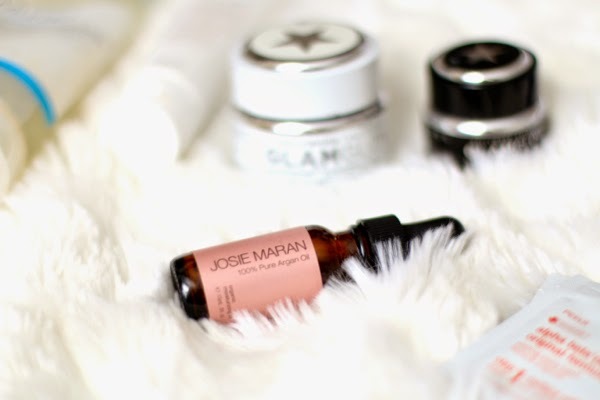 Josie Maran Argon Oil This is a product I have been using for years now and have loved it more and more! This is what I use as a moisturizer at night. YES, it is an oil and I love it! I have NEVER broke out from it and wake up with nothing but soft skin. Not oily looking, not greasing, just soft and hydrated. I like this product because it is so pure and I can mixed with other things if you need on your face (i.e. self tanners). NOTE: I have not been happy with the “light” version they have to offer. I find it very oily and thin. I would suggest getting the regular thing. You won’t regret it. Spot Treatment. Many friends have recommended this spot treatment for awhile now. I have liked it so far. I feel it does the job but my all time favorite is still Philosophy Spot Treatment, although I haven’t been able to find it in the stores lately only online. They both are great but I feel that the Philosophy helps fade the blemish discoloration a lot faster. I hope this helps you guys a little bit and let me know if you have any questions. I’m no expert but I have used a TON of stuff! Glad you did this post. I'm needing to switch things up a bit, and I find it to be overwhelming going into Sephora and just looking around. Thanks for sharing. You're so welcome! Sephora is great but cAn be a lot! They always give samples of everything is you want to try it before you buy it! Good luck! Hope you find some things you love!